Today is the World Book Day. We celebrate that ancient custom, forgotten by many, sacred for few. This is a famous festival but do you really know why on this date? Two of the best writer in history died the 23rd of April 1616: Miguel de Cervantes according to the Gregorian Calendar (actually, he was buried that day) and William Shakespeare, according to the Julian Calendar. Unfortunately, another famous writer died last Thursday the 17th: Gabriel García Márquez. 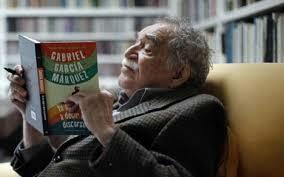 Today we want to commemorate the World Book Day remembering Gabo, (his nickname). We’re sure that many students on www.spanishviaskype.com we’ll have read these words: Muchos años después, frente al pelotón de fusilamiento, el coronel Aureliano Buendía había de recordar aquella tarde remota en que su padre lo llevó a conocer el hielo. (Many years later, as he faced the firing squad, Colonel Aureliano Buendía was to remember that distant afternoon when his father took him to discover ice). Due to those lines, the Colombian writer will go down in history. However, we recommend our students of Spanish on Skype to read more of his works: Amor en los tiempos del cólera (Love in the Time of Cholera), El coronel no tiene quien le escriba (No One Writes to the Colonel) or Crónica de una muerte anunciada (Chronicle of a Death Foretold). Gabo said once: “Escribo porque quiero que me quieran” (I write because I want everybody to love me). You got it Gabo, we love you. Feliz Día del Libro.